A little background, I live in sleepy old Bangor, Maine. It is the shopping and cultural center of northern and eastern Maine with its nearly city-like population of 32 thousand. It does contain one of most every major chain store though, so I thought, naively it seems, that I had a pretty good chance of walking into a store and actually buying an Xbox 360. This, to say the least, was not to be. Of the local stores, Best Buy (the vaunted launch partner) received the most units, a staggering 40. Our Wal-Mart had 14, the Target was the proud owner of 16, the Toys’r’us seems to have fallen off Microsoft’s radar rating a mere 6, Sam’s Club got it’s mitts around 20, Circuit City had some unknown but small number. Gamespot and EB are of course sold out through the new year (just like the rest of the country). Guess what? One late night/early morning later, I still lack a big, white box of doom next to the telly. Let’s break it down by store. 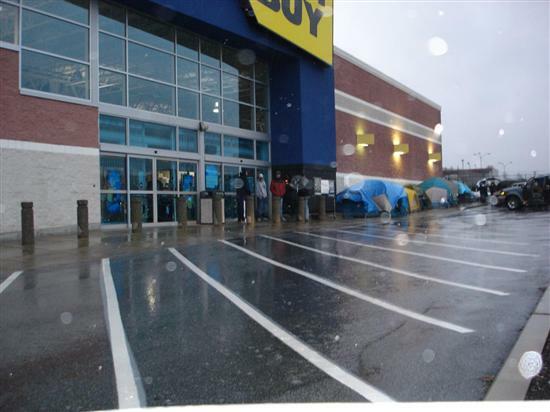 A large group of males with nothing better to do stacked out a claim (along with tents) in front of Best Buy the evening before launch. So much for those forty. Wal-Mart, we learned too late, had started the line at 7am on Monday. As even I am not a big enough looser to spend an entire day in Wal-Mart just to buy a game console (for that it would have to be life or death) this would have been a no go anyway. Target and Circuit City also faced the dreaded campers. It was a cold, rainy night in Maine, we were not that serious about getting an Xbox. At Sam’s Club I thought I had a chance. For those of you that are unaware, you have to be a card carrying member to shop there. In addition, I have a business account, which gets me in the door 3 hours before the general public. In fact, it got me in early enough to see their last Xbox walk out the door. Fan-didly-astic! Did I mention that I don’t live it what most rational people would even consider a large village?